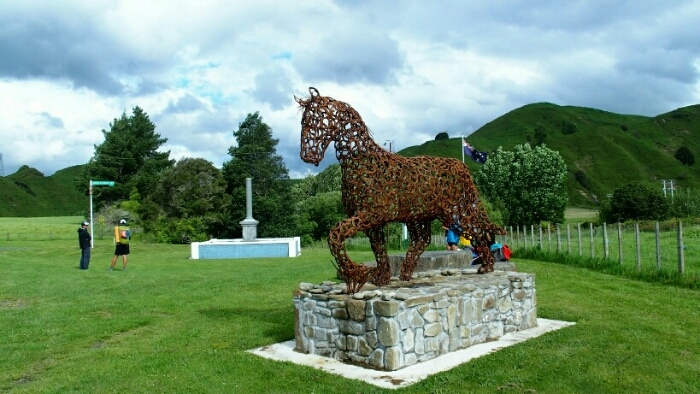 From Ohakune to national park and Whakahore. ​Day 44. National Park – End Upper Retaruke Road. 28km. Total 1193km. 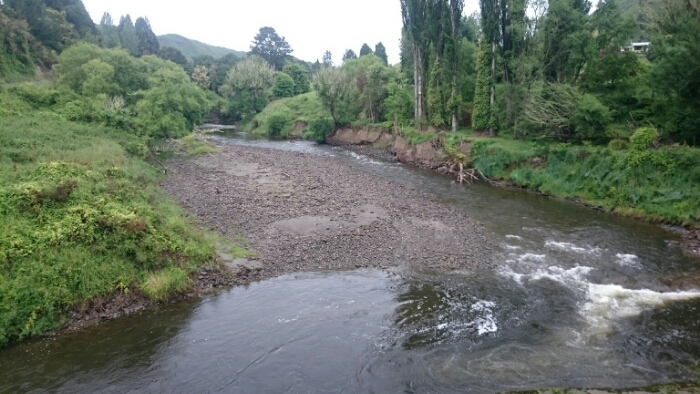 (I skipped the 20km from Whakapapa Village to National Park due to the Round the Mountain Ruapehu trip / bad weather and wanting to join my friends for the Whanganui river). Last night I met a very nice girl from Australia in the hostel who proposed kindly to take me to National Park. So after having enjoyed the luxury of being just on my own in a 4 bed dorm as well as the nice facilities of the Ohakune YHA, we leave at 8.30am. It takes just 30minutes by car to National Park, but I could have continued talking for ages. Some people you meet are so inspiring! 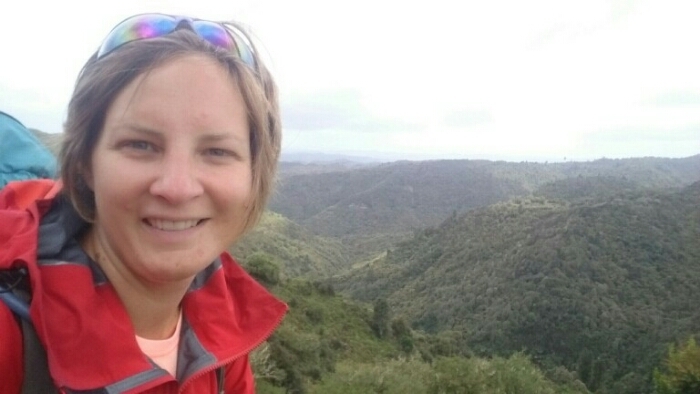 She came to Rotorua for a 50km ultra run and enjoyed some more time off in New Zealand. 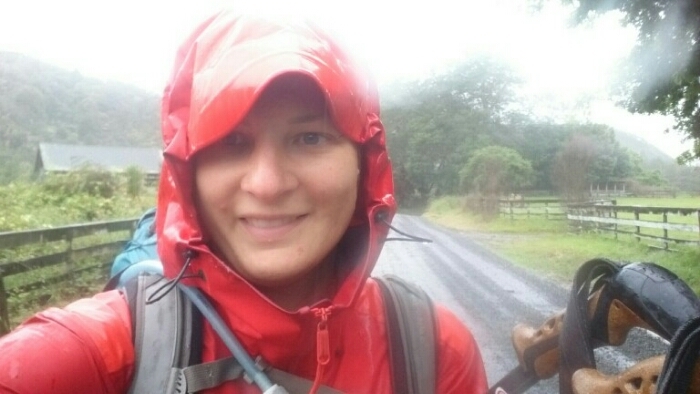 Next year she’s doing a 4 months run through the length of Australia for fundraising, 4,500km. Impressive! But for me, time to hike. It’s 52km in two days so even if I am tired today after all the big efforts the last days, it should be easily doable. Once out of the tiny ski town National Park, I follow the Fisher Track. It’s a mountain bike trail from the mountains to the sea. Hiking is hence pretty easy, downhill on a well formed track. The weather is not as bad as expected, the sun comes out from time to time and although it’s very cloudy, it’s only raining a bit from time to time. I take my time and enjoy the views on dense rainforest, once a group of bikers comes along but otherwise it’s just me. I find a perfect little spot around 11.30am, I am tired and have a short nap sitting in my rainclothes as there are a few short showers in between the sunny bits. Then time for a nice lunch, avocado, hummus and tortilla. I continue but soon feel tired. I filled up on water as the long road section after the Fisher Track has little water according to my trail notes. The gravel road is completely empty, I follow it for quite a while without any cars coming by. At the intersection with the next road I take a rest, my pack is getting heavy so I eat an apple 😉 I continue a few more minutes when it starts to rain for good. This time it’s not just a shower. I hide underneath a tree. It’s just 2.30pm and I have 37km left to Whakahore landing. I can do that tomorrow in one day on the road, but I don’t really want to. I also don’t feel very comfortable camping here, but if it continues raining like that I might have to. The rain is stopping just as I hear some familiar voices! Matt, Quinn, Jess and Brad are there! Yeay, now I am going to have some company! We hike together on the road, catching up on the last days. So good to see them, I am not tired anylonger, hiking on this kind of road is much easier when you can chat the time away. Plus the sun is back now. Around 4pm we start looking for a place to stay. 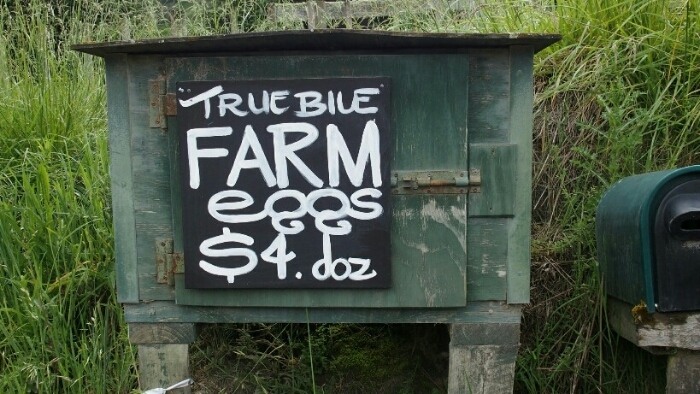 We see a box offering a dozen eggs for 4$ and buy them for dinner. So good to be with a bunch of other hikers and share these kind of small things along the way. We start checking out houses but no one is around. At the end of the road though there is a little place with toilets, a stone table with benches and even a water tap just at the fence. Mountainbikers on the trail are often picked up here, hence this nice place which is perfect for us for camping. Almost no cars around and the only neighbour waves at us friendly so it seems alright. We start cooking dinner but without grey clouds coming up we set up our tents in between. Luckily as we cannot even finish dinner as it starts pouring. All dry in my tent I can finish my dinner and as the rain gets less share some chocolate with the others. I am happy to not be camping on my own at the road and even more happy to be again laughing with my Canadians! Day 45. 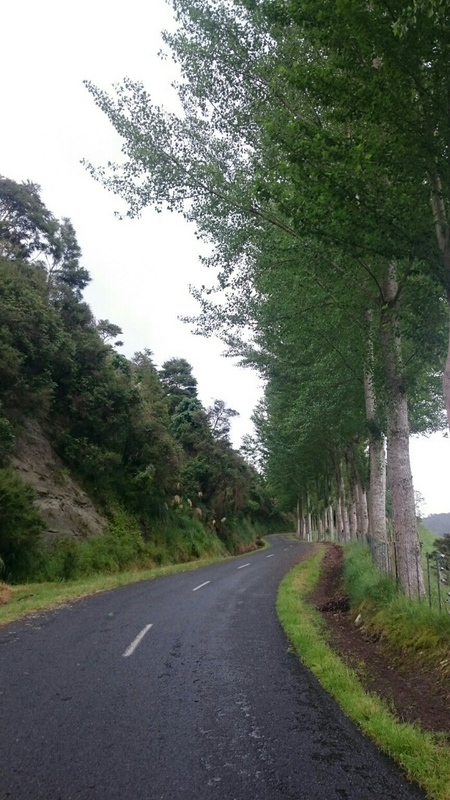 End Upper Retaruke Road – Whakahore. 25km. Total 1218km. It’s been raining the night and still some showers this morning. I start at 7am and the others are also packing up. I am following the same gravel road for the whole morning, 25km, into Whakahore. It’s so nice to have a lot of time ahead and I would love to take it easy and make breaks and enjoy the nice landscape with the rovers and hills. But the rain is getting worse and worse until it’s just pouring. I can handle a bit of rain but this is too much. Luckily I arrive at a small shelter with firewood and hide in it, having lunch. The Canadiens are coming and we continue together, arriving around noon at the Blue Duck Cafe where a nice fire is on. We spend the afternoon here with soup, hot chocolate, trying to dry a little. We book online the last 5 spaces in the DOC hut next door. As it’s a basic hut they unfortunately don’t have any fireplace so better to stay a little longer at the café. There are plenty of people around who are doing the river journey. I also found out that we will actually be canoeing and not kayaking. I have never done this before, how exciting! I just hope that it’s going to rain less…. Next Post Whakahore – Flying Fox Lodge. Floating on the river. That’s so nice you found my blog! I just loved the Tongariro national park area (I am a mountain lover after all). I am having such a wonderful time in your beautiful country with the amazing hospitality and friendliness of the Kiwis. Thank you! How great and inspiring your tramps are! I always look forward to your blog posts! 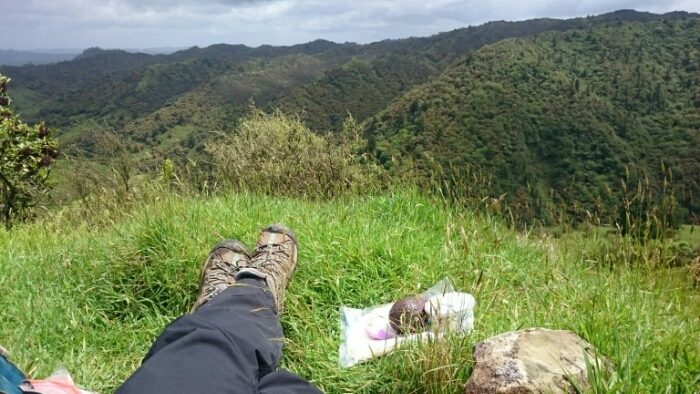 I’ve been tramping in NZ some 15 years ago (only small day to 3-4 day walks) but I would like to get there again and do some more. Good luck on the Whanganui river, it will be so much fun! And keep on posting your lovely blog posts!